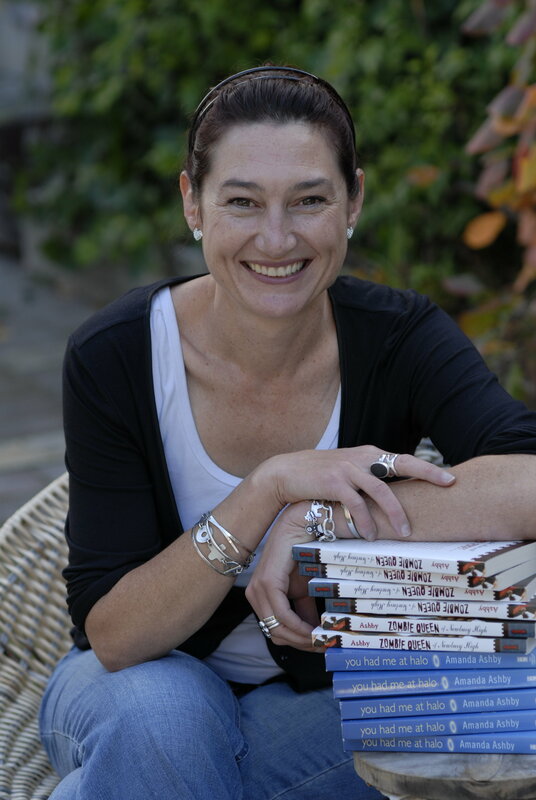 Today, we welcome young adult and mid-grades writer Amanda Ashby. Amanda’s books You Had Me At Halo and Zombie Queen of Newbury High are available for purchase. Of course, if you stick around for the interview, you’ll find a chance to win a copy of Zombie Queen at the end. Romantic Journey: Hi Amanda, thanks for taking the time to talk to Romantic Journey. My twelve-year-old daughter loved Zombie Queen Of Newbury High. Can you give a brief synopsis and tell us what inspired you to write it? 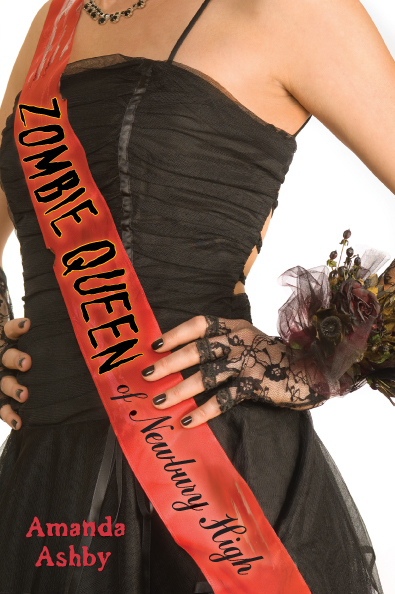 Amanda Ashby: Yay, I’m so pleased that your daughter loved Zombie Queen of Newbury High – that’s so cool!!! Anyway, my book is about what happens when Mia Everett does a love spell in order to stop her prom date from dumping her. However, instead of doing a love spell, she unleashes a zombie virus on her entire senior year (teachers included). She then has to work with a by-the-book zombie hunter in order to find a cure before she ends up first course on everyone’s new flesh-only diet. As for the idea, well I used to always threaten my critique partners that if they weren’t careful I would write a book called I WAS A KILLER ZOMBIE BRIDE and make them read it. Of course the more I said it, the funnier it became until I suddenly thought perhaps I should write a zombie book. This was over two years ago when it was all about vampires so I really wasn’t sure if there would even be a market for it, however the minute I pitched it to my agent she was very keen and she managed to sell the book two weeks after she submitted it. Then, by the time it came out, zombies had become the new big thing so it was all a case of right place at the right time!!!! RJ: Can you tell us the names of any other books you have published? RJ: How did you first get published? AA: I tried to get published for many years and while I often got close, nothing quite seemed to work. Then in 2005, my dad died. I was living in England at the time and I flew back to Australia for the funeral. It was a pretty awful but throughout the day I kept imagining that he was doing a sort of commentary of the funeral, from up in heaven – and let’s just say he wasn’t best pleased with some of the details! Anyway, three weeks after I got back to England I had an idea for a girl who was looking down on her own funeral. From that moment I was hooked and I wrote the book in about three weeks. Not long after that I signed with my fabulous agent, Jenny Bent in New York and she went and sold it to NAL who are part of Penguin in the US. RJ: If you weren’t a writer what would be your ideal occupation? AA: Honestly, I’ve never found a job that I love as much as writing so I’m going to just ignore this question since I don’t want to give the universe any nasty ideas! AA: I work every weekend at the Napier library at the children/teen desk, which is ideal for me. Firstly because it’s not full time so it gives me plenty of time to write during the week and be with my kids when they finish school etc, plus I get first dibs on all the new books that come through get to help kids choose some really great books to read!!! RJ: What’s the worst/weirdest job you’ve ever had? AA: I once had a part time job sitting in a room filled with cut up foam and we had to stuff it into these meter long brown faux leather tubes that were going to go on a giant echidna for part of a big procession. We did it for a week before the designer decided that the quills looked to limp and they would make them out of fiberglass instead! RJ: How would a typical work day unfold? AA: I check my emails while I’m eating breakfast and then I take the kids to school (notice I’m glossing over the dramas of getting the kids ready ‘to’ take them to school). Then I go for a walk along the beach and back home to write. I do tend to muck around on the Internet too much as well but I try and give myself a word count so that by the time I go and collect the kids, I don’t feel like a complete slacker. RJ: How do you let your family know when you are in serious writing mode? AA: It’s a very subtle process that I’ve developed over the years and it normally involves shouting, swearing, burning their dinner and generally behaving like a demented person so that they then try and avoid me at all costs. It’s been surprisingly effective!!!!! RJ: What is the biggest blooper you’ve ever written? AA: I’m an impatient Aries with absolute no eye for detail At All so I have a huge number of bloopers to choose from, though my absolute favorite is from You Had Me at Halo when Holly, the heroine, passed Vince, the hero, a drink. Unfortunately, as my critique partner pointed out, since they were actually in the same body, all that happened was that the drink was passed from one hand to the other!!!!! Thankfully that was caught before the book was sold, but it still makes me smile!!!! RJ: And what line that you’ve written continues to amaze you? This can be in a bad or good way – we really don’t mind. AA: I’ve got a very bad habit of laughing at my own jokes so I’m constantly writing lines that I think are thigh-slapping hilarious and everyone else thinks are just ‘eh, okay’. Still, I suppose as long as I amuse myself, that’s all that matters. Jane Austen and Georgette Heyer have taught me to look for the humor in everyday situations and build it through characterization, while Ursula Le Guin, Suzanne Collins and Raymond E Feist are a constant reminder to me of how much I love fantasy and books that have complex world building (something that I’m very bad at unfortunately). RJ: Can you give readers the links to any social networks you have? AA: I tweet as @amandaashby. I talk books at goodreads. I also spend time on Facebook – just visit my website to get the link. RJ: Are you a chest or buns woman? Please give examples of an ideal chest or set of buns and marks out of ten. AA: What? I have to choose? Because really I don’t think that’s fair! my first true love, David Boreanaz who took his shirt off numerous times in Buffy and Angel – thank you Joss Whedon for your vision! and absolutely no chest list would be complete without Gerard Butler in 300 – I mean seriously did you see that twenty-four pack? It was insane. RJ: If your life were ever made into a movie, which actress would you like to play you? Why? To play your husband? Gross miscasting is acceptable. AA: Well obviously my husband would be David Boreanaz and since I’m not exactly a sharer, there is no way I would cast anyone else to play me because that would just be crazy!!!!!! RJ: If Zombie Queen of Newbury High were ever made into a movie who would you want to play Mia? And Chase? AA: Chace Crawford from Gossip Girls is pretty cute – and no, my Chase isn’t named after him since I wrote the book long before I saw the show! As for Mia, it’s a toughie because the actresses I like are probably a bit too old to play her now so how about I just let some unknown girl get the role! RJ: If your ship was sinking and you could grab one thing on the way to the lifeboat, what would it be? Go on instinct here; don’t let common sense interfere as you grab your hairdryer or laptop instead of food to take to the desert island. RJ: And last, spill the beans about what you’re writing at the moment and when it will be released. AA: I’m working on book two in my new mid-grade series about an eleven year old who gets turned into a djinn (genie) the day before she starts sixth grade. It’s lots of fun – well it’s fun for me, not so much fun for my poor heroine Sophie, who despite being a very positive person is struggling with getting her powers under control, none of which is helped by her ridiculously annoying ghostly djinn guide, who looks like Zac Efron’s older brother and has an unhealthy addiction to junk food and American Idol. The first book is out in Summer 2011. I also have another young adult book called Fairy Bad Day, which will be out in Spring 2011.
RJ: Thanks, Amanda, that was great. I know my daughter will be keeping a close watch for when your next book hits the shelves. Following The Romantic Journey in the Facebook Networked Blogs application. The link appears in our right-hand sidebar. The winner will be announced 8 December. Entry deadline is 11:59 p.m. UTC on 7 December, 2009. Thank you for the excellent indepth & fun interview with Amanda Ashby. Thanks to Amanda for sharing. I really enjoyed her humor and learning more about her and her writing. I posted about this interview & giveaway on my blog for midnight Wed Dec 2nd at http://rkcharron.blogspot.com and I follow you on Twitter already. PS – This was an EXCELLENT interview. Yes enter me too if this is international! International entries are accepted. We’ve got writers all over the world, and we welcome readers from all over, too. The contest is closed. Check back early tomorrow to find out who won!